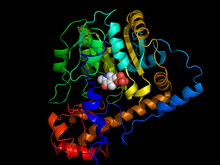 Aspartate aminotransferase from Escherichia coli bound with cofactor pyridoxal 5-phosphate. ^ PDB 1AAM Almo SC, Smith DL, Danishefsky AT, Ringe D. The structural basis for the altered substrate specificity of the R292D active site mutant of aspartate aminotransferase from E. coli. Protein Eng. March 1994, 7 (3): 405–412. PMID 7909946. doi:10.1093/protein/7.3.405.